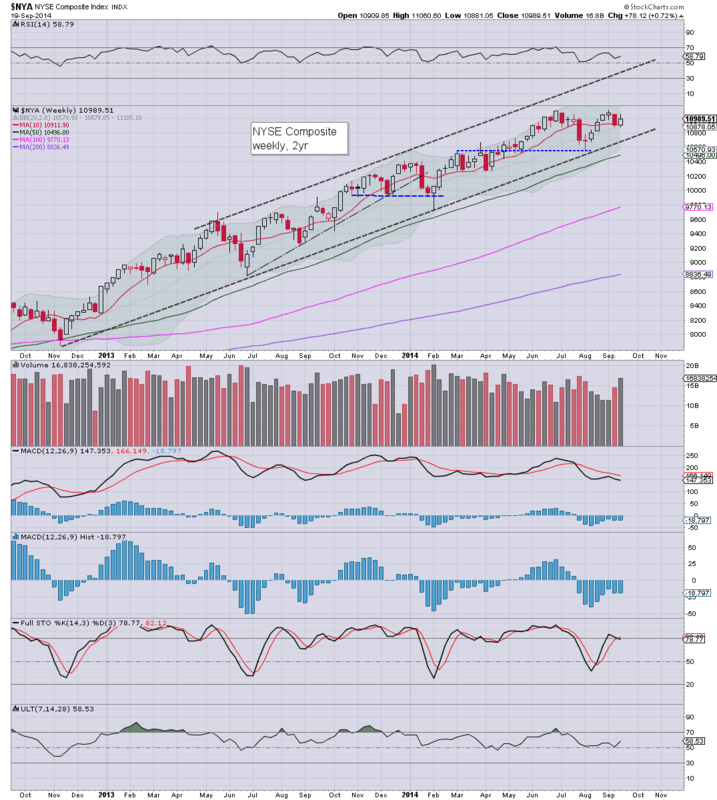 Most US equity indexes saw net weekly gains, ranging from 1.7% (Dow), 1.25% (sp'500), to 0.3% (Nasdaq Comp'). 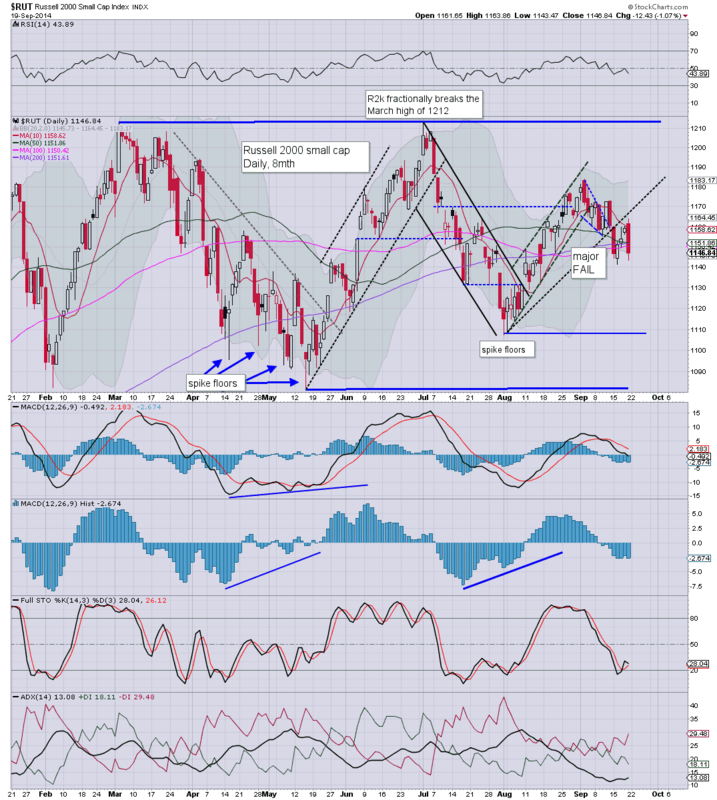 The exception was the usual laggard - the R2K, which slipped a somewhat significant -1.2%. 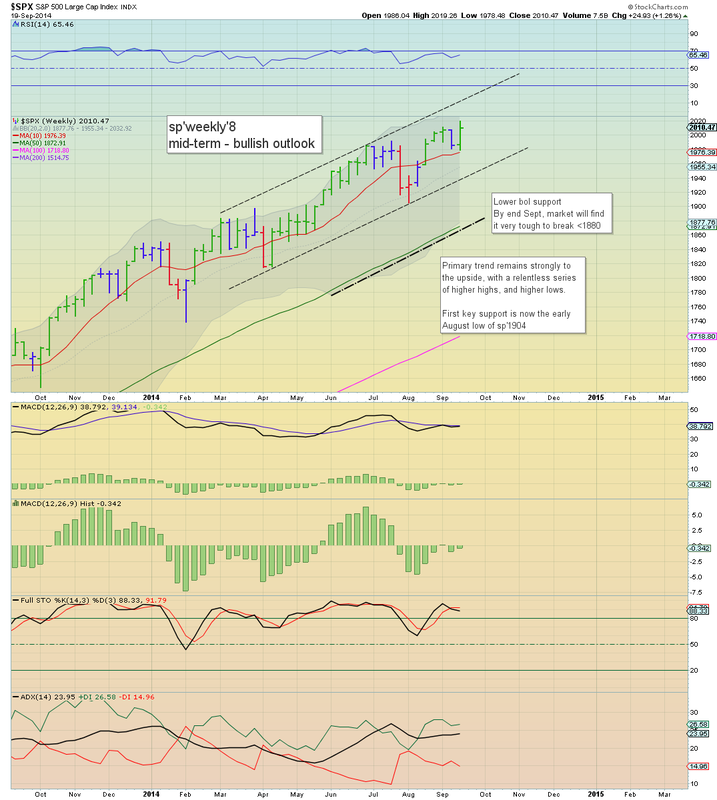 Broader market trend remains... bullish. 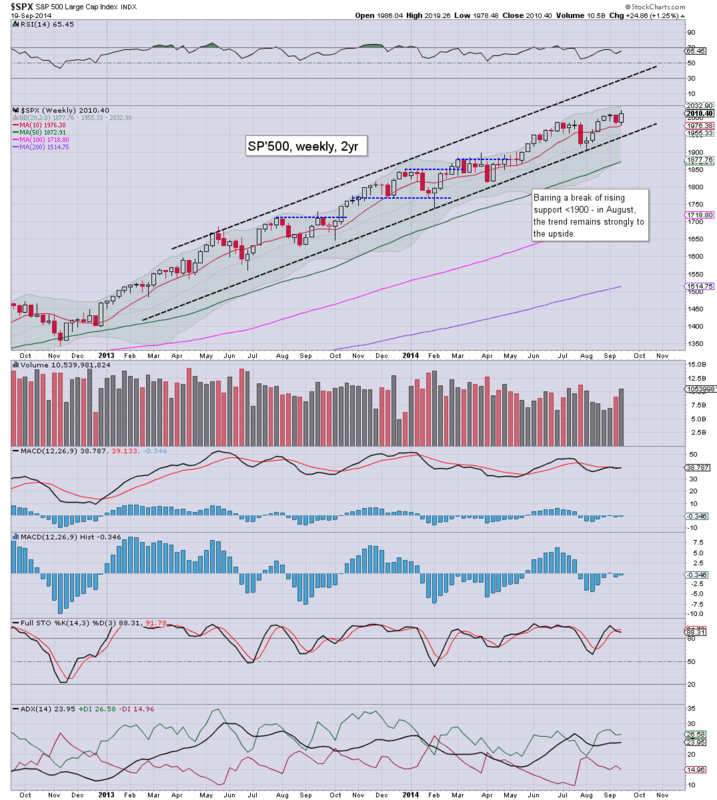 Most notable for the sp'500, the weekly candle was of the bullish engulfing type. We saw a marginal new low of 1978... but a new historic high of 2019. 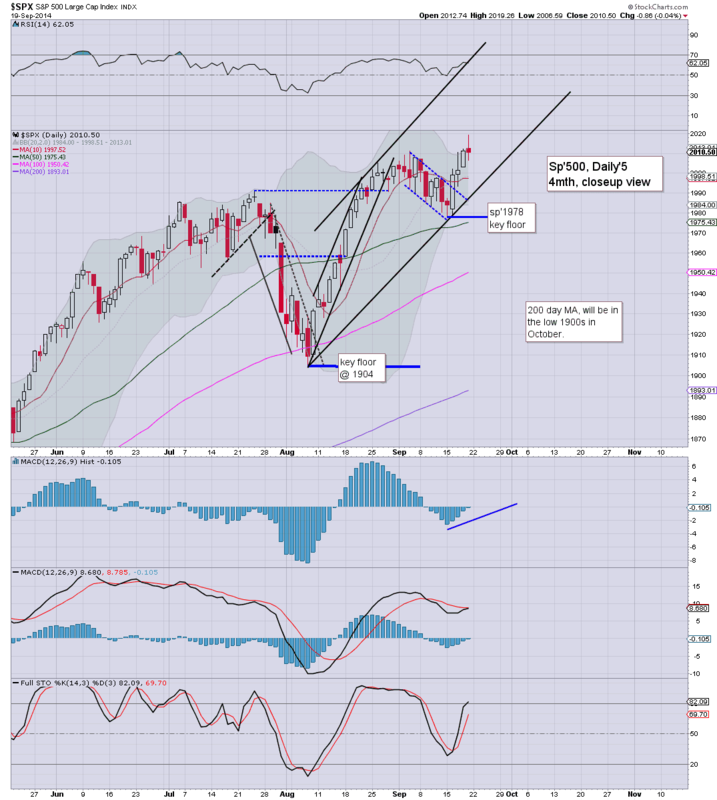 The upper bollinger on the weekly cycle is offering the 2030s in the immediate term. Underlying MACD (blue bar histogram) cycle ticked higher, and is set to turn positive at the Monday open. Equity bears have nothing to tout unless they are able to retrace all the way back to the early August low of 1904... and right now, that looks completely out of range. The tech' only gained 0.3% this week, but still, it was the sixth consecutive weekly close above the 10MA. There is nothing bearish here. The mighty Dow climbed a very impressive 292pts (1.7%), breaking a new historic high of 17350. 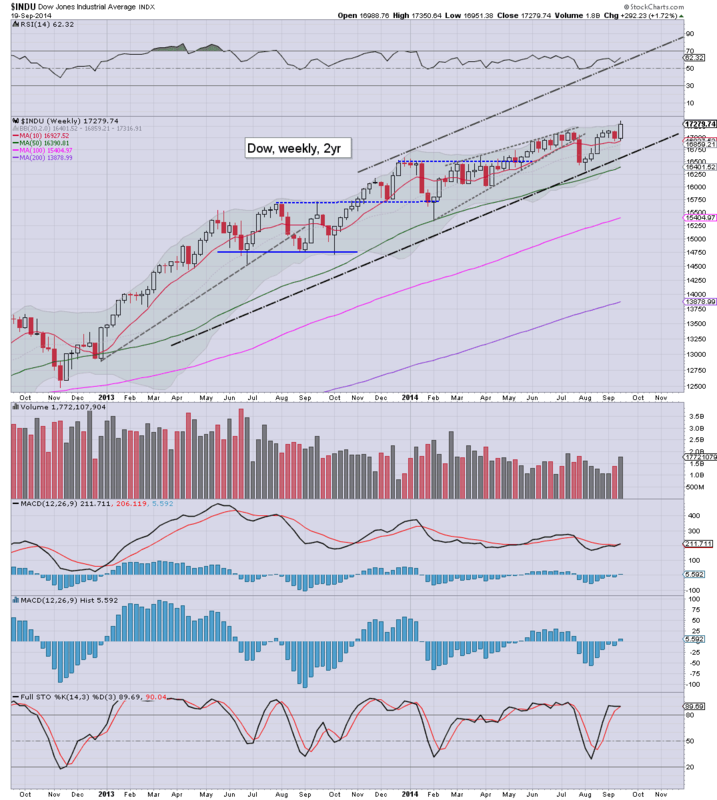 The Dow is now scraping against the upper weekly bollinger, upside to the 17400/500s looks viable by end month. The master index gained 0.7%, with overall price structure across the last few weeks.. a rather clear bull flag. 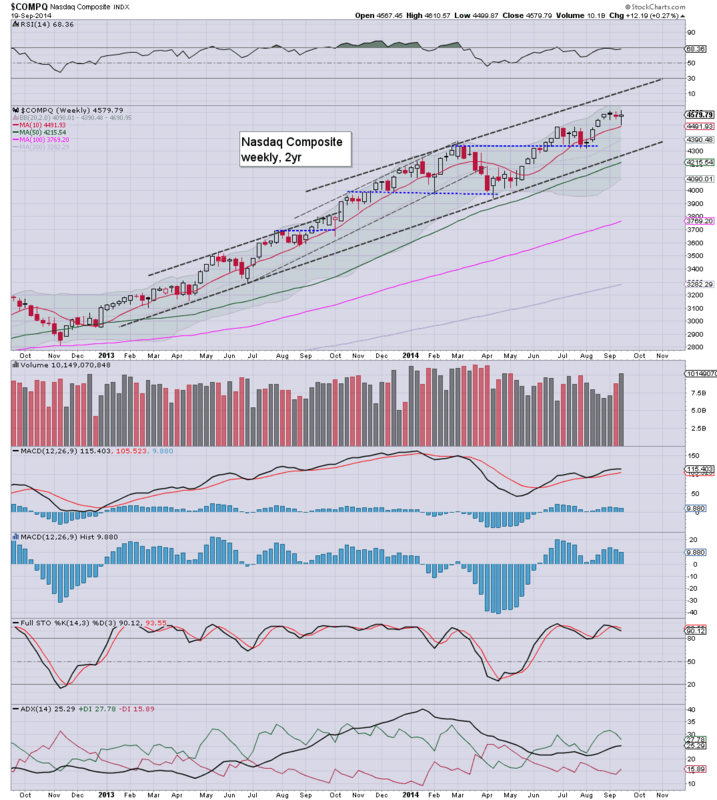 Upper bollinger is offering the 11200s within the immediate term, which would equate to sp'2035/40. The second market leader (well, it used to be), declined for the third consecutive week, by a rather significant -1.2%. The critical floor remains 1080, which is currently still a comfortable 5% away. Lower bollinger is now around 1100, and it would be very surprising if we penetrate below there. The 'old leader' - Transports, gained 0.9%, breaking a new historic high of 8714. There looks to be near term upside to the 8800s, and there will be stiff resistance around 9k across October. So.. 5 of 6 indexes gained, but the R2K continued to slide. What to make of this? I understand how some would continue to highlight the R2K as an early sign of main market weakness, and that the broader market is going to hit a wall at some point.. which of course is true. 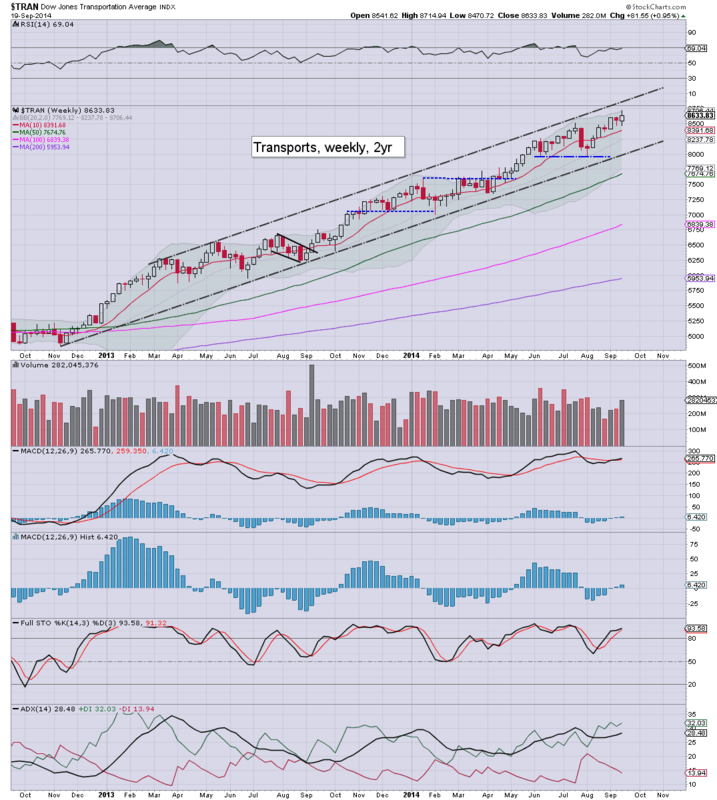 Yet... what if the R2K is merely coiling up - much like the Transports did across the entirety of 2012? I continue to have a real concern that the market will merely continue to grind higher - and perhaps at an accelerated rate for a further 12-18 months. 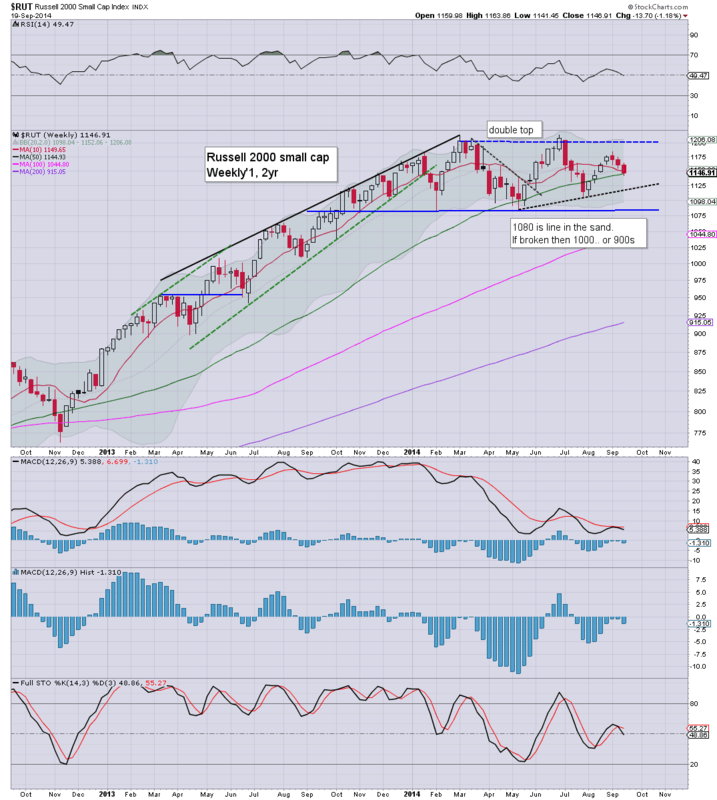 Without question, the market continues to broadly head higher, and unless we break under 1080 in the R2K, and retrace all the way back to the August low of sp'1904, bears have absolutely no reason to be shorting this powerfully bullish market. There really isn't anything too significant next week. There are a sprinkling of fed officials talking in the week, not least Dudley, next Monday morning. *QE-pomo: Tues' $1.7bn, Wed' $1bn. Perhaps most notable this week was the weekly candle itself - of the bullish engulfing type, having broken last weeks low of sp'1980, but closing above the high. There looks to be easy upside to 2020/25... and then the 2030s by end month. A green candle for the week, and it certainly reinforces the notion that the bullish uptrend has fully reasserted itself. There is little reason why we won't make a hit of the upper bollinger band, that is currently in the mid 2030s..and rising. By early October... it'll be in the 2050s. US equity indexes closed somewhat mixed, sp -1pt @ 2010. The two leaders - Trans/R2K, settled lower by -0.5% and -1.1% respectively. Near term outlook is for continued broad upside to the sp'2030s. 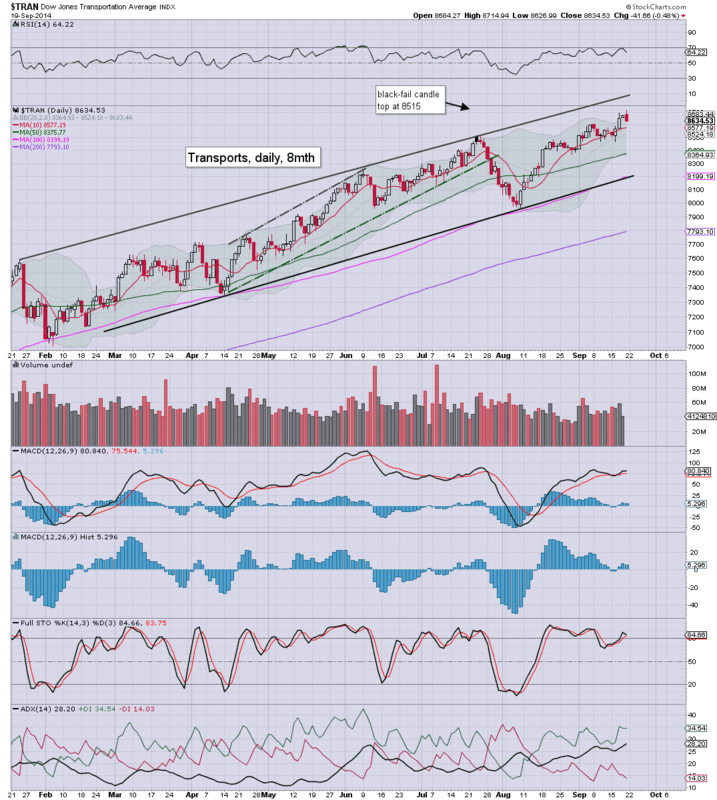 *it was notable that the Dow, sp'500, and Trans all broke new historic highs this morning. Little to add.. the broader upward trend continues.